During my recent escapade to Philadelphia to attend the Seed Your Future board meeting, I was able to visit Chanticleer in the offseason. 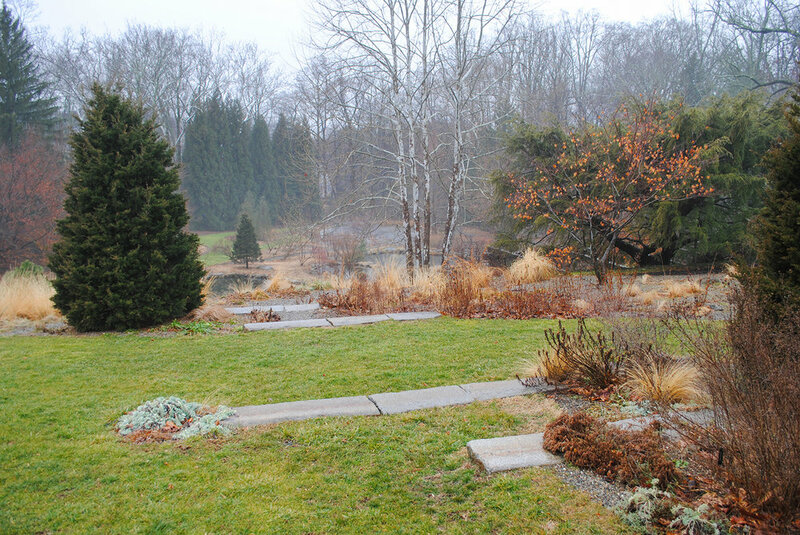 I love seeing a garden in each of the four seasons, and winter was one I hadn't witnessed at Chanticleer. 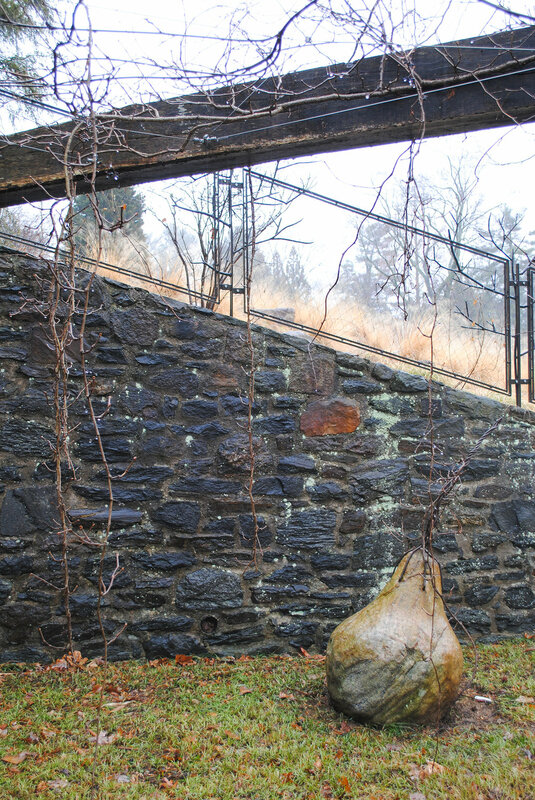 If you haven't been to this pleasure garden in Wayne, PA, most horticulturists will tell you it is in their top ten favorites. For me, I'm mesmerized each visit by how the gardeners weave creativity into plantings of both ordinary and extraordinary flora. Even with the dearth of many flowers, forbs, and foliage, the garden still looked stellar. Below are photos with comments along the way. The big takeaway for me from the visit was a reminder of the importance of incorporating strong lines into garden design and then maintaining them. From this overlook view, manicured lines delineate areas, and different colors of the detritus enhance the contrast next to the torpor turf. A close up from the previous image taken from the bottom of the elevated walkway. Here you can see different materials compose different beds. Mowed ornamental grass in the foreground, and fall leaves in the ovoid beds in the back. The serpentine plays homage to the agriculture crops grown in the Pennsylvania countryside and features a different crop each year. Even from a distance you can make out the bold curves of the bed. An upclose shot of the serpentine. Again, look at how neat that border is between the turf and the bed. 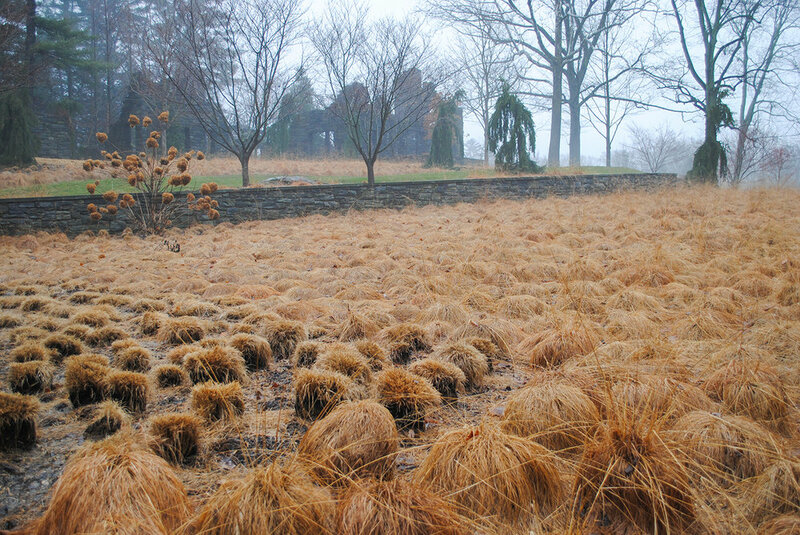 Curvilinear turf severs this sea of Sporobolus heterolepis. The contrast between tamed lawn and wild grass already creates interest, I feel it is even greater now that winter color has manifested on the prairie dropseed. It appeared that one part of the Sporobolus prairie had a test burn. With the foliage removed, you can really appreciate the cespitose nature of the grass. 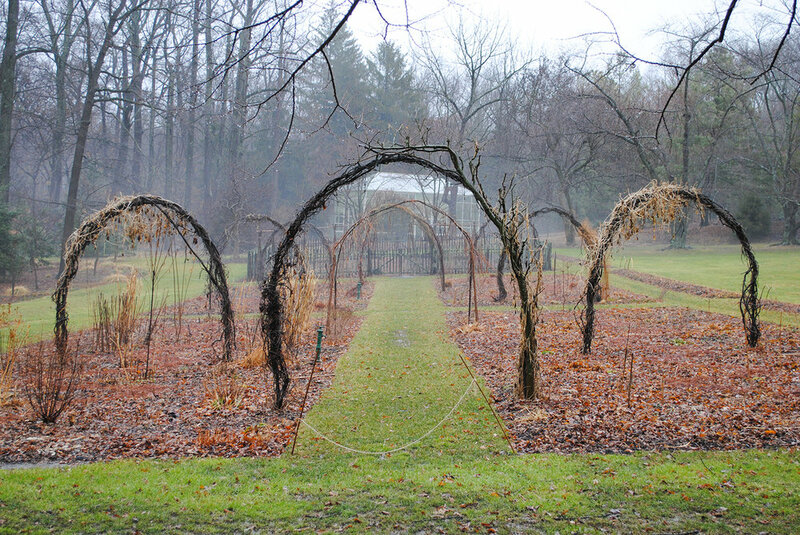 With the dormancy and death of plants in the cut flower garden, curved arches provide drama when little remains. I like to appreciate their importance by imagining their absence. One behind the scenes practice I witnessed was the staff's efforts to keep plants alive. Here yuccas in the gravel garden were covered with plexiglass. 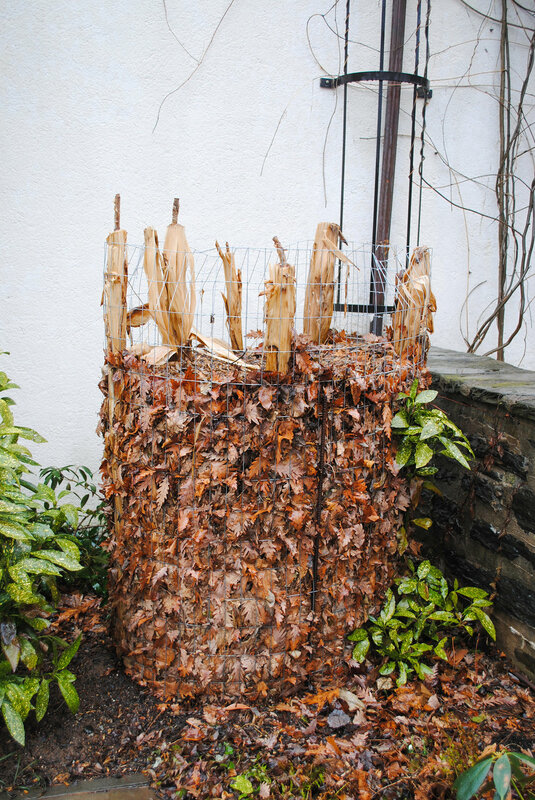 And, here caged leaves insulate a tender banana near the tea cup garden. A lone Schizachryium echoes the color of the blazing branches of Salix alba 'Britzensis' in the background. 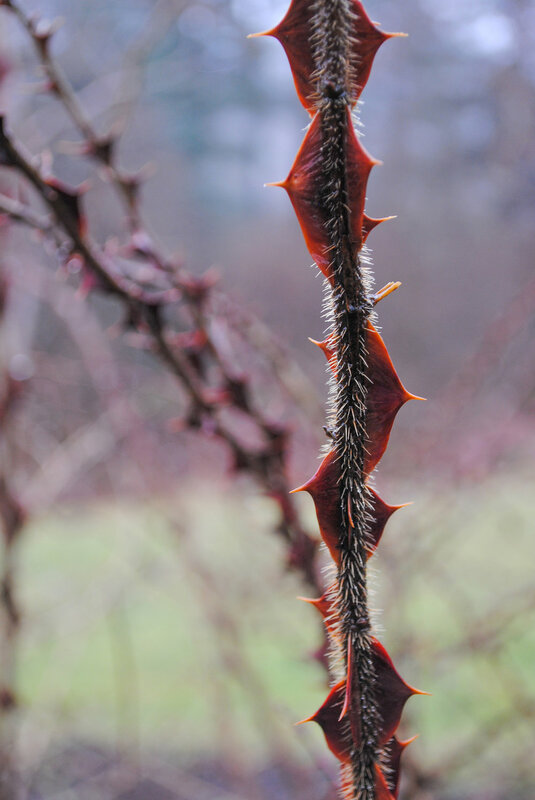 With the foliage gone, prickles on Rosa sericea subsp. omeiensis f. pteracantha (whew, that's a mouthful) are quite visible. A glance towards the pond. Nary a weed to be seen. In all my visits I've never seen this three-foot-tall, stone pear. A final shot of a prominent primary axis that runs part of the length of Chanticleer. Such primary axes help to connect separate parts of a garden.